Social Media for Plastic Surgeons: Snip, Snip, Snapchat? Recently the New York Post ran an article describing a spike in interest, particularly among millennials, in watching plastic surgeries shared on Snapchat’s multimedia messaging app. “Millennials are binge-watching surgeries on Snapchat,” was the provocative headline. Zwivel spoke with several prominent plastic surgeons to find out what they think about the trend, and to learn more about how they use social media to engage with patients – or as a window into the live operating room. Instead, Dr. Eviatar uses Facebook, Twitter, and occasionally LinkedIn. He’s careful to only post on his practice’s social media platforms when it meets his professional goals. 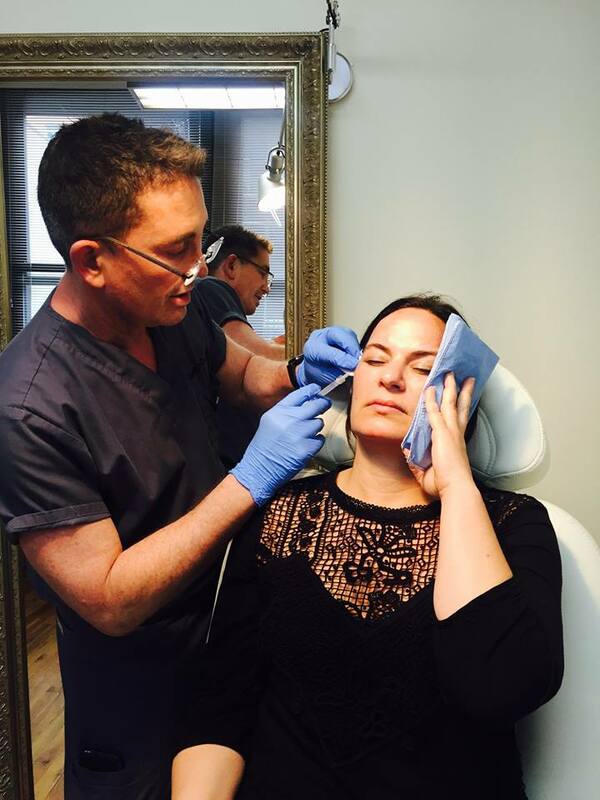 Dr. Eviatar treating staff member Vanessa with a combination of Restylane Lyft and Sculptra. Connecting with potential new clients is another common reason for having a robust social media presence. Beverly Hills plastic surgeon Dr. Glenn Vallecillos uses social media specifically for that purpose, as well as to inform an increasingly knowledgeable public on the clinic’s new technologies and procedures. Dr. Vallecillos uses Snapchat to display new tools and practices the clinic is offering, but “for technical reasons,” he prefers the live broadcasting app Periscope, which ties into Twitter and “has the potential to reach a worldwide audience.” Though he posts live video on social media, Dr. Vallecillos has seen some ethically dubious use of the platforms by fellow plastic surgeons. “In my community in Beverly Hills there are a number of plastic surgeons and other medical professionals utilizing Snapchat – some tastefully, and some with questionable delivery tactics,” he says, without pointing any fingers. Dr. Shah has found that social media is the perfect place to showcase procedures and behind-the-scenes experiences, and plans on posting more live videos to Snapchat. On Snapchat, specifically, Shah has found that the demographic is largely on the young side, and that it’s especially popular among millennial women, one of his core target audiences. He’s learned more about how the platform works thanks to his own kids. Similarly enthused about sharing on Snapchat is Dr. Justin Yovino, who uses Snapchat every day at his Beverly Hills practice. Happy Saturday! Take your kid to work day. Check out our snap [email protected] for the video. While documenting plastic surgery on Snapchat may be new, publicly broadcasting medical procedures behind-the-scenes is nothing of the sort. For decades, television shows on networks like TLC have showcased patients’ experiences on the operation table. “My 600lb Life,” to name one such program, often gives graphic glimpses of gastric bypass procedures. Although some viewers may at first be motivated by their fascination for the grislier aspects of the procedure, they also stand a chance of actually learning a thing or two about how it’s performed. At its best, Snapchat is a platform that can further this educational endeavor. Why not let interested parties get a look at something they’re curious about if the patient consents? Why not demonstrate the technical skills required to perform surgery? That should be the primary goal, as Dr. Shah notes, but as Dr. Aaron Kosins in Newport Beach, CA will tell you, it’s a delicate balance between being educational and exploitative. Social media, filled with blobby emoticons and fleeting “likes,” can be a pretty lighthearted affair, but doctors mustn’t be fooled: what they post reflects seriously on their practice and ethics. Surgeons need to weight the pros and cons of sharing surgeries on social media, even if they have only the best intentions. What I’ve found is that patients are typically more than happy to be models for procedures. They take pride in it, in fact. The pros, in Dr. Shah’s opinion, are “pretty straightforward,” while the cons are bit more complicated. Aside from checking off all privacy forms, the most important thing you can do is make sure that your patient – who very well may be enticed to visit you because of your Snapchat videos – gets the necessary education and evaluation needed for his/her desired procedure and isn’t misled by what is shown online. A great candidate for surgery may find your practice based on a Snapchat video or two, but be careful not to use Snapchat to sell your services, a behavior that Dr. Shah sees all too often from fellow surgeons.